I forgot to include the suggestion boxes last time. I assure you that was entirely accidental, and I really do want your suggestions! I went away for the weekend just after posting (only about 15 minutes later, in fact) and I wasn't able to correct the problem before a bunch of people submitted. New? I suggest you start this series at the beginning here. I'm not really in the mood to talk with you, right now. In fact, I'm not really interested in talking to anyone. I'm just in one of those moods, where I'd rather curl up on the couch with a book instead of doing anything productive. My week was pretty stressful and tiring. I have to admit, though, I really enjoyed most of today (Saturday). I was finally able to go to the library as you suggested. A few times I became tense from all the people there. But, I did have fun browsing the books and reading in such a lovely space. I read most of Gentleman Corgi: A Memoir. I will try to make a trip to the library part of my weekly routine. What is going well in my life? Huh...let's see...well, my job I guess. I've already gotten a few promotions, so I guess my bosses are pretty happy with me. This week I got a "thank you" from someone in the office as an urgent package came for them, but their name was smudged. I hunted them down, so the package was still delivered on time. Outside the office, I try to fill out some reports every evening. They don't pay me extra to do this, but it needs to be done. Here's my journal from the end of the week. Thursday was a bit rough. I had utility box problems, and I couldn't sleep because of a rat making noises. So, I called the Landlord. When i finally went to bed, my neighbor started being noisy. Choose which topic/question Kaye should address next. Why do you think you check off "uncomfortable" so often when tracking emotions? What is one thing you want to change? Choose which self-care activity Kaye should try next. What are your suggestions for future topics and activities to appear in the polls? What do you want to ask Kaye? What do you think Kaye should do? I suggest you start this series at the beginning here. 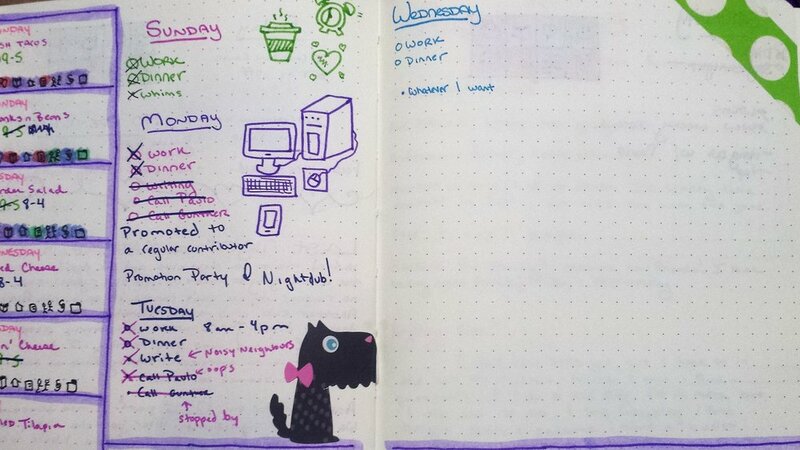 A lot of the Bullet Journals are very beautiful, decorated with stickers and drawings. I'd love to be able to do that, but I don't have the time or the talent. You asked me about my dream job. Well, I really don't know. I would have loved to have done something creative...writing, painting, sculpting, music, but I have absolutely zero talent for those types of things. When I was a child, I really wanted to be a veterinarian. I'm definitely not smart enough for that, though! Yeah, Wednesday was a little bit stressful. The utility box has been acting up in my apartment. I keep losing power, and it keeps sparking. I think I also have a rat problem. I called the landlord, which was also pretty stressful. Fried utility box and dripping pipes. UGH!!! I got a promotion. I'm now an office assistant. I'm in charge of supplies, so I get to make important decisions like how many boxes of paperclips we might need in the near future. Since things were pretty stressful, and I got a promotion, I rewarded myself with some pizza. I'm an awful cook, so this was a pleasant change of pace! Anyway, that's all for now, I'll write again soon. What should Kaye talk about next? The top-voted item was discussed, but other topics that received votes are repeated here. So, even if your choice doesn't make it this week, your vote still matters. What is one thing in your life that is going well? What is one thing you'd like to change? What should Kay do next? I had a lot of wonderful responses, keep them coming! I will be posting five here, but I will save the others for later. First off, I'd like to apologize. I have no idea what I'm supposed to be writing really. They just told me at the clinic that I should submit at least one entry to this address per week. I'm not even sure if I started the entry correctly. The clinic assigned me this task because I've been feeling sick a lot recently, but they can't find any disease or anything. I was told it is because of my anxiety and depression. I have to admit, I'm a bit skeptical. I think I'm doing okay. Sure, life has been hard lately, but I'm managing. It's not like I've attempted suicide, or had some sort of mental crisis. I'm fine. But, I'm willing to try anything to make myself feel better. And, it can't hurt I guess. I live in a small apartment in San Myshuno. I moved here recently when I got a job in the mailroom of Dewey, Cheatem & Howe. It's not great, but it pays the bills. I pretty much spend most of my time by myself sorting mail. I like not having to interact with strangers. I live by myself- no roommate, no pets, no boyfriend. It can get a bit lonely, but it suits me fine. I don't have time for much of a social life. I don't know where all the time goes, but I always have things to do. On the rare occasion that I have some time, I like to read. So, I guess that's it for now. Oh, they told me I could send photos. I'm not sure what photos you'd want, so any suggestions for the future would be welcome. This is me in front of the elevator at my apartment building. And this is my hallway. And that's my kitchen down there. Alright...that's all I have. Let me know what I should do next. A/N: The Bullet Journal will show up in the next post. What would you like to ask Kaye? After each of Kaye's posts, the community gets to be her therapist! You get to select a question you'd like to ask her and recommend an action for her to take over the next week. Actions and questions will be selected from the ones submitted the previous week by the community! What is one thing about your life you'd like to change? Could you tell me about your day? What do you suggest Kaye try next? Here's your chance to make a difference. What questions do you have for Kaye? What would you like her to talk about? Do you have any small changes she can try next? Write your ideas down here, and I'll use them when I create the next set of polls! Thank you so much! I'm so excited you chose to participate! New Bullet Journal Challenge with a Self-Care Twist! Because of my ongoing love for Bullet Journals, I've decided to do another attempt at a Bullet Journal challenge. Thanks to a lot of encouragement from the Sims 4 forum community and some readers, I've come up with a story idea that I'm super enthused about. I'm going to take my original "If My Sim had a Bullet Journal" challenge idea and add to it a separate but related Self-Care challenge. As someone who has made a lot of progress in dealing with anxiety and depression over the last year, it is something that I am very passionate about. 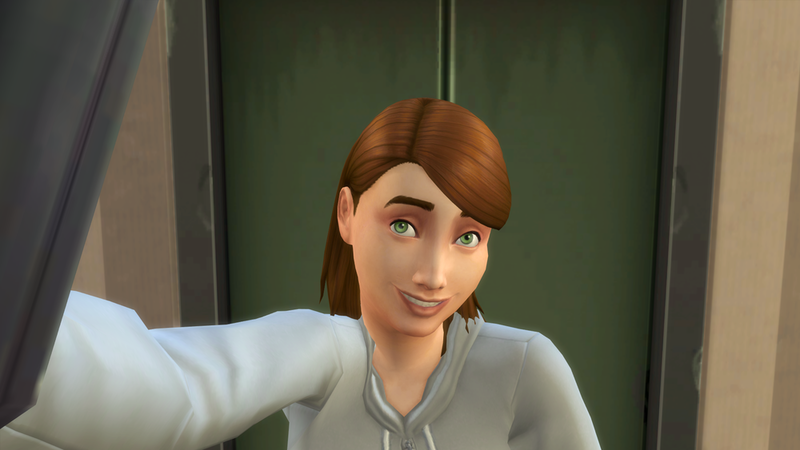 1) I've created a Sim that has three traits that might cause her to become tense. 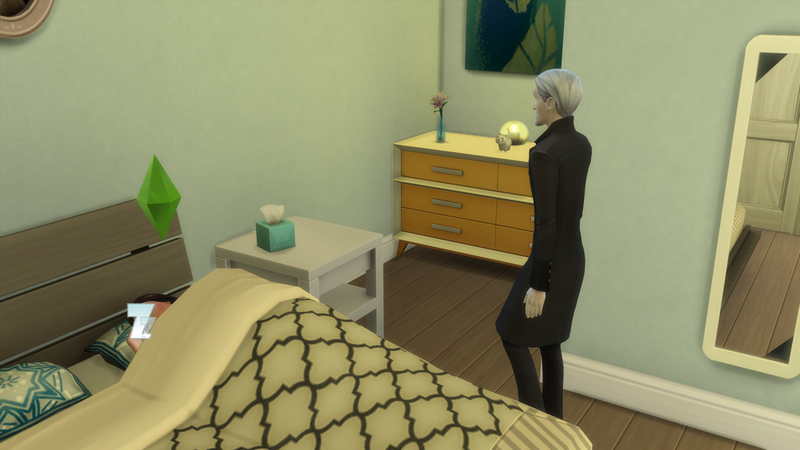 For example, if my Sim had the "ambitious" trait she might become tense if she hadn't been promoted for a while. I'm specifically not going to tell you which traits she has. 2) Next, I created a list of 10 rules that represent her anxiety and depression. These are self-imposed rules that she has established for herself that set unreasonable expectations. In my personal experience, a lot of anxiety stemmed from the demands I was putting on myself. Once again, I won't be sharing what exactly these are, you'll see why in a minute. 3) In order to eliminate these rules, she has to earn satisfaction points (a mechanic already in the game). When she hits a certain level of satisfaction, she can spend the points to earn a reward trait (in game) and eliminate one of the rules that I set. 4) With all the rules she has, earning any satisfaction will be very challenging, and that's where her online therapist will come in. YOU, my dear readers, will play the therapist. 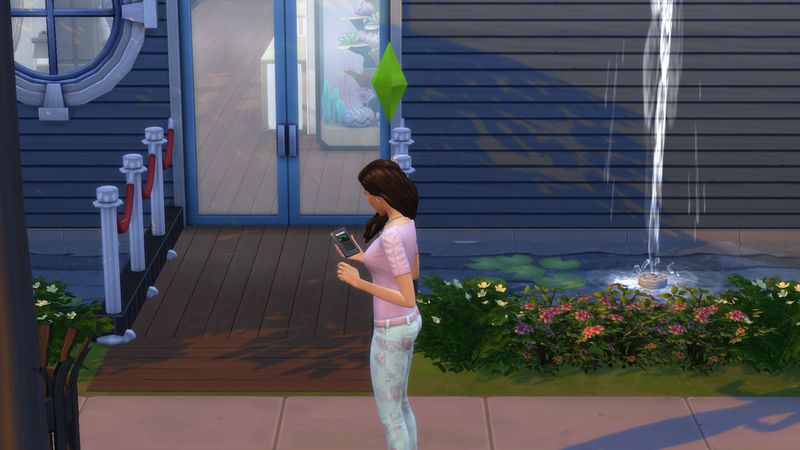 Each week, you will be encouraged to comment with suggestions on self-care activities my Sim can do. We will have a poll that will determine which self-care activity she explores that week. 5) Since you don't know the rules or traits, there is a bit of a mystery here in terms of what she needs to do. You can use the clues from her letters to you and her bullet journal to help you decide how to best help her. There are SO many suggestions you can make for self-care! OH so many that are entirely doable in the game. 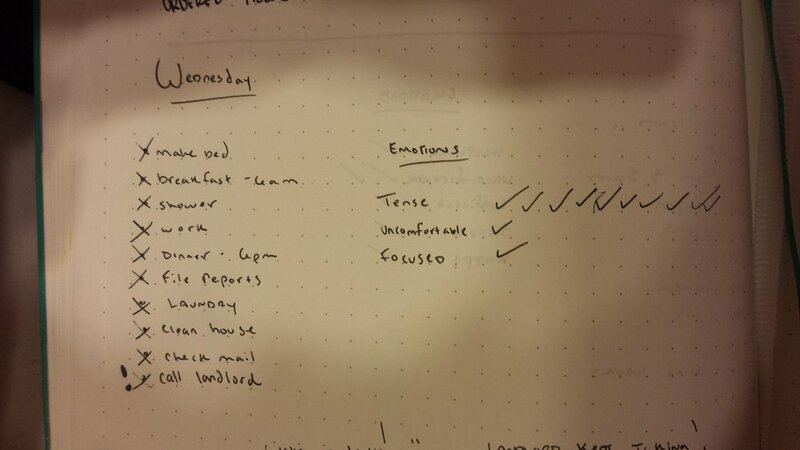 Keeping track of emotions? Sure! Gratitude log? Sure! Day off? Sure! Adopt a cat? Sure! Writing out her goals? Yep! Travel? Of course. Spa day? Sure thing! You can also ask her questions to find out more information, and she'll address them in subsequent letters. So, what do you guys think? I'm excited! It's a day off for Edith! She is hoping to spend sometime with her boyfriend and her good friends today. Edith had a weird dream. She dreamed a vampire crept into her bedroom while she was still asleep. He hypnotized her, and made her walk into her office (why she has no idea). He bit into her neck and then disappeared. Leaving her passed out on the floor. Edith awoke a bit groggy, but didn't think anything more about her dream. She met the Avant Gardes for a group hangout at their favorite coffee shop. They chatted in the main area while everyone ordered their drinks, and then dispersed. Edith and Gunther went into the club room- a private room in the back of the shop designed for the meeting of clubs. Yuki joined them. They read, and chatted about what they were reading. A nice pleasant afternoon. In the evening, Edith gave Anaya a call to see if she wanted to do dinner together. She was game, and they met at a restaurant. They had a wonderful time talking over dinner and drinks. It was nice to some one-on-one time with such a close friend. After dinner, they ordered a chocolate cake. Why not? Edith is now entering the middle portion of her young adult life. It's time to make some changes to the Bujo and reevaluate our goals. I'll be adding extra collections to this slowly over time. 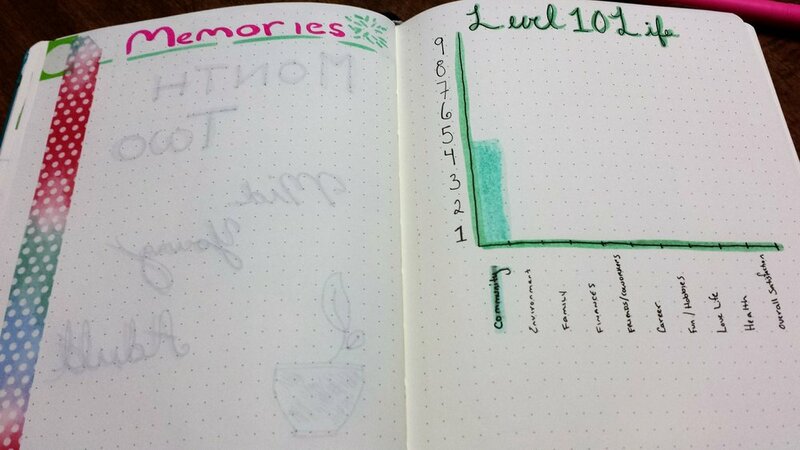 So far, other then the cover page, we've setup a section to record memories, and we've begun a level 10 life spread. It's seems like FOREVER since I have written to you, but it only has been a few days. Time is such a weird thing, don't you think? How are you? How is your family? How did you meet your wife? So...you live not too far from me. Have you met the weird very angry man that hangs out in the center of the neighborhood? I keep trying to befriend him, but he ends up just spreading his anger to me! It's so frustrating. A couple days ago, I had my first kiss with Paolo! It has certainly taken us long enough! Paolo, and my best friend, Gunther are getting along quite well. It makes me so happy. They often show up at my apartment at the same time! I have mixed feelings about my neighbors. They are super sweet, and their son is simply adorable. However, they are frequently noisy at night and it's so frustrating when I am trying to write. Do you have any issues with your neighbors? Tomorrow I have plans to get together with my good friend Anaya, whom I do not spend enough time with. Here's a selfie of me and my best friend, Gunther, in my apartment. Arg! I had my whole entire letter already written, and then I had computer issues! You think being a professional writer, I'd have a better habit of saving my work often, LOL. Oh well, here's a fresh letter just a bit later. Hi there! How are you? I'm doing very well. Thank you for agreeing to be penpals with me. I'm super excited to get to know someone new. I love meeting new people. In fact, hanging out with friends is one of my favorite activities....it's right up there with reading and writing. I spend most of my time doing those three things. As I mentioned, I'm a writer. I'm a self-published Children's author, and I also work at a newspaper. Up until this past Monday, I wrote their advice column, but I've recently been promoted to regular contributor where I can write stories more interesting to me. Most of that will be serial short stories. I hope to someday be able to support myself and a family on just my author's salary. I love reading and dancing. Sometimes I watch movies or TV, but I usually get bored with those pretty easy. For awhile, I was into fitness/wellness, but I admit it's been a little while since I've been to a gym! :) I like cooking, but I also love eating from food carts. Whenever I can be home, I try to cook a meal, but often I find myself out with friends at dinner time....Monday night I had french fries at the bar for dinner. I hang out with my friends all the time. I'm in a club called the Avant Gardes for others who like to read and write. I hosted a meeting at my house last night. We had a great time, and one of the younger members made me a gorgeous piece of art! The day before, my best friend Gunther was at my apartment already when I arrived home and we hung out for awhile. And on Monday, my friends through a party for me at the nightclub for my promotion. And whenever I'm not hanging out with them, my neighbors are also great companions. I wanted to get more photos for you before I sent this letter, but I haven't had time. I promise to have more next time. Here's a selfie I took on Monday night at the nightclub! It's with my crush Paulo! I'm going to wrap this up with a few questions for you....What do you like to do for fun? What do you do for a living? Do you live with any family? Tuesday's plan was to work from 8am to 4pm, have dinner (garden salad), work on her writing, and then call a few friends. When she arrived home, Gunther was there. He always knows when she's having a bad day and shows up for some fun after work! Edith and Gunther played some chess for awhile. After which, he kept her entertained while she made dinner. Despite the fact he had no plans to stay for dinner. After Gunther left, Edith took a shower. She relaxed with some television (the classics station). While she was watching, she called Paulo and they chatted before she went to bed. Wednesday is more work with Grilled Cheese for dinner, and her plans are to do whatever she feels like doing. Before we check in with Edith today, I just wanted to thank everyone who stopped by my website thanks to the link in the Bullet Journal July Newsletter. I appreciate you checking on my Sims challenge, and I hope you continue to check in. Also, if anyone has any spreads that they'd like Edith to try out, please let me know! We are Bullet Journalers so tweaking is always happening! Should she have more detailed spreads? More actual journaling? More collections? Edith's plan for Monday was pretty simple...work, dinner, writing and some phone calls. Of course, we've already seen how those plans can go astray! At work, Edith was promoted to Regular Contributor at work! So, of course, the Avant Gardes took her to the nightclub to celebrate! After sharing some fries with Maaike at the bar, while they waited for everyone else to get there, they spent the evening dancing. Edith ran into Paulo, her newest crush! They took a selfie together. When are these two going to start dating?! Sunday, the beginning of Edith's work week. Edith started off with a healthy breakfast of oatmeal. Her weekly royalties were also deposited into her account. She's starting to go quite the impressive collection. Not enough to become an independent author, but it definitely helps with the bills. Edith finally met her neighbor's son! We thought she was pregnant when they first met. Edith read him a story. That out fit. Those sunglasses! What a little charmer!!! Edith has also started working on a bookshelf collection in her Bujo! Friday was a day off, but after last night, Edith had planned to take it easy. Here is Edith's plan for the day. Edith journaled about her experience last night. She was inspired to do some writing, but Jesminder and her husband were being noisy, so Edith was getting frustrated. Later in the day, Gunther came over to play chess, and Jesminder popped over for awhile as well. After Gunther left, she took a nap and followed that up with some reading and telephone conversations. Sorry about the fuzzy quality of the last photo, it was taken in haste. Thanks for reading! Please leave comments, questions, and suggestions for Edith. I love chatting about the Sims! She started off the day by getting inspired before work. She played around with the lump of clay she keeps in her apartment to get her creative juices flowing. She made a lovely statue. She made the Pho she had planned to have for dinner that night. After dinner, she planned to read and go to bed early. However, Maaike invited her to go out to a club in Windenburg. Edith was in a good mood and she was off of work tomorrow, so she agreed. She ran into Marcus and he introduced her to some of his friends including this guy Paolo, whom she immediately hit it off with. They all chatted outside the club for awhile before heading inside. The Avant Gardes had a great time hanging out with Partihaus. Edith danced with her crew. Despite being excellent dancers and a bit intimidating, the members of Partihaus were actually very nice and welcoming. Edith kept her eye on Paolo the whole evening. They chatted inside, as best they could...despite the short time they were together, they were starting to form a deep connection. Edith felt super confident and had an amazing time. The club was just so energetic and vibrant. She stayed there as late as possible before heading home and crashing. She had plans to do some writing, yoga and clean her house. She was going to focus on taking care of herself today. Gunther didn't let that happen. He showed up while Edith was cleaning and still in her pajamas. She didn't mind the company, though. Jesminder smelled Edith's delicious Mac n' Cheese and popped over to ask if she could join in. Edith also invited Anaya to join them. There was laughing, storytelling and eating. They all spent most of the day there. After deepening her friendships with each of them, Edith said goodbye. She then got busy writing a new book= a collection of short stories for young adults. Thursday was a worked day, so promised to be very mundane....Work from 9am to 5pm, a bit of chess and Pho for dinner. She had another simple day planned, which was a good thing given how busy she's been the last few days. Reality caught up with her. Upon arriving home from work, she passed out on the couch. She woke up and showered. Instead of the taco casserole she had planned, she ate a microwaved pastry. She went to bed feeling very unsatisfied, but too tired to care. Some more scribblings from Edith. And, finally, the quickly written plan for tomorrow. Note: I made a spreadsheet with a way of calculating crushes based on a variety of factors. Travis wouldn't be my first choice, but he is winning for Edith which is why he is our prime target. But that plan had changed by the time she got home that evening. She was promoted to "advice columnist". And her co-workers wanted to celebrate her success by taking her out to the Oasis Dust Bowl. Her promotion also came with a new chair for reading. Gunther was the one to coordinate the celebration and met her outside the bar. She enjoyed some dinner while chatting with all her co-workers. Edith was pleasantly surprised to find Travis at the bar. After their meeting at Singles night, she was developing a crush on him, and she new he was on the market which increased the appeal. She was under the impression, after their great conversation the other day, that they were on the same page. She did a bit of playful flirting and then asked to exchange phone numbers. We were both so shocked, that we forgot to take a screenshot! Luckily, Gunther was nearby ready to swoop in and take some silly selfies! Edith's Bullet Journal: Week Three Setup! Here we have Edith's filled in Week 2 Checker Life Check. Green is the best category, so she did quite well in week 2. Here is her Week Two spread at the end of the week. She experienced a lot of happiness this week, but was also uncomfortable and tense more often than we'd like. She needs to seek out new ways to feel inspired, since that didn't come up often and she's trying to be a writer! She improved her charisma, cooking, fitness, wellness, writing and dancing! She also learned many new recipes. She has a new financial spread. She is trying to save up $900 (in addition to her regular savings goal) to purchase a shower/tub combo...so she has the option of taking a shower or a bath, instead of just a bath. Here is her Week Three setup. I didn't write down all her work times yet, since I think she'll be getting a promotion on Sunday. Her goals are very similar to last week but with her total whims and total savings higher, obviously. She also wants to turn one of her friends into a "good friend" this week. And finally, here is our plan for Sunday! If you have any ideas for spreads that you'd like to see included please let me know!!! If you'd like to see more information, more journaling, etc...we can expand!